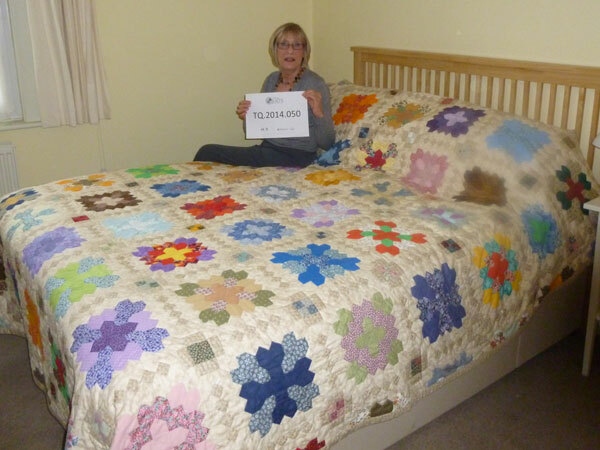 Jacqueline introduces her ‘Lucy Boston’ quilt, a traditional English Paper hand pieced and quilted king-sized quilt. She talks about the ‘journey’ of the quilt metaphorically and literally, as the quilt includes a mix of fabrics from her stash with their own stories and she has pieced the blocks over 15 years during world and personal events including holidays abroad. 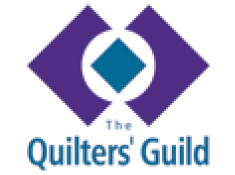 Later she explains about the important of different quilt groups at different stages in her life, the role quilting has played in her professional life as an Occupational Therapist and about the spiritual value of crafts like quilting. Jennifer Wenborn [JW]: Okay, good afternoon Jacquie and thank you very much for agreeing to take part in our Talking Quilts project. Just to confirm this is Jennifer Wenborn interviewing Jacqueline Isles at [address] London on Monday the 8th December. ID number TQ.2014.050… okay, so Jacquie if we could start of by just looking at the quilt that you brought along today. Jacqueline Isles [JI]: May I just say that it’s not finished. JW: Okay that’s fine [talking together]. JW: Yes…yes, yes….. oh wow! Can you tell us a little bit about the quilt? Does it have a name? JI: It does and I have done you some photocopies. I call this quilt, ‘My Lucy Boston quilt’ and….I photocopied that for you which is a bit of a history about Lucy Boston, [JW: Okay lovely. 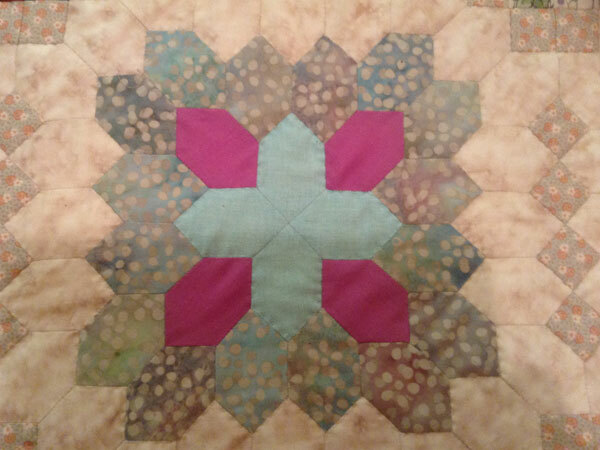 ]… but her quilt which is called, ‘patchwork of the crosses.’ Was featured in Popular Patchwork in September 2000 and I wanted a project that was gonna be a journey rather than a destination. So this quilt got started in June 2001. And the reason I chose it was because I wanted some hand sewing that could be in my handbag that I could take all around with me and I have to say I have a particular passion for hand patchwork because I like the fact that you’re close to it and there is a close connection between yourself and the work you are doing. And being a bit of a purist, anybody can machine, you know, cut and whatever, this to me is pure patchwork and quilting. And certainly if you look back through the history of patchwork and quilting this was how it started in this country. And I feel to a certain extent we have been perhaps taken over by our American colleagues but that’s been brilliant, that’s been very creative, but to me this symbolises… um… English Patchwork. Um and it’s very pure in my opinion. And this quilt has been started in… um, June 2001 and not only are the pieces significant in terms of the fabrics because I started off that I wasn’t gonna buy any more new fabric at all. I was actually going to use what I got. And like every quilter I had huge amounts. And so apart from the… um, stuff that brings it together I did not buy anything new but I had to have, I had to buy some, I did not have enough fabric to pull it all together. JW: You mean by the background and the…? JI: The background and the sashing yeah. There had to be something unified. [JW: Um.] Because its, it’s all over, yer know, there is too many colours and it’s quite nice. Because in the 24, it’s a lozenge shape, the… patchwork piece, and each side is an inch. And there is 24 lozenges in each block but how you put those blocks, how you organise those blocks with the colours, the permutations is that you get five different permutations that keeps the central cross theme in, in all the blocks. And that’s what unifies it. And as I say I have given you the thing about Lucy Boston and Lucy lived in Hemingford Grey and her house, her daughter-in-law is keeping the house, open and I went up to see her quilt. [JW: Mmm.] And… that’s a postcard of the quilt. And I was already half way through mine and Diana Boston was raving saying, ‘You must bring it back when you have finished it.’ [JW laughs]. Well I haven’t been back yet but feel it’s sufficiently together to take it back, ‘cause I am actually hand quilting it now. 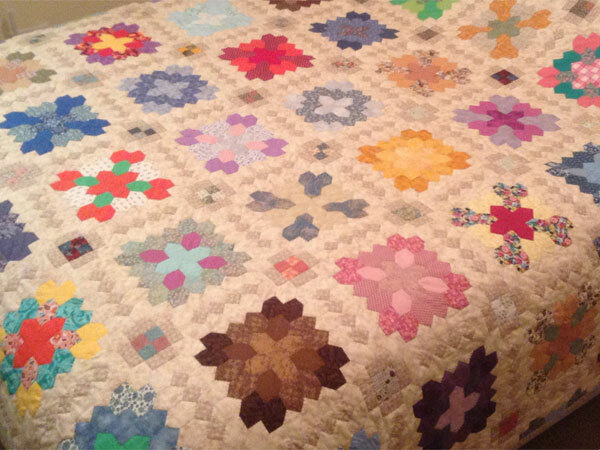 And… the name of the quilt is, ‘My, my Lucy Boston Quilt.’ [JW: Mmm.] Because basically I have taken her idea and I have translated it for myself. And I have never wanted this quilt finished because it is a journey. And not only does the pieces have significance in terms of what other things they have got into but for a lot of the blocks I know exactly where I was when I was putting them together. A lot of the work has been done in the car… sitting down times. This has seen three World Cups and I can tell you there is four or five blocks in there that I distinctly remember doing… I took it to… India. I have taken it, not the whole thing all the pieces, ‘cause there used to be when you could put them in the suitcase…and you don’t have to take scissors, you can just take cutters so they can go on the planes, wasn’t a problem. I took it too New Zealand. I took it to South America, Brazil, Bolivia, Paraguay, Peru when we went across there. I have taken it to the US five times including our train journey across and it was very difficult not to buy more fabric when I was out there to incorporate it in this. [JW: Mmm]. But as I say it has been a journey that… has… that I don’t want to finish ‘cause I am hand quilting it now. And I can go weeks without working on it. But I always keep it out so if I have got an odd ten minutes I can, I can do some of it. And that is how all these blocks have been put together… and I do not know who the recipient of it is going to be but I laugh, and I say I might take it with me when they put me in the Old People’s Home. And I have just started another project like this, some hand piecing, that I am doing using the Japanese folded patchwork so that I have got another hand sewing project on the go. And a lot of people ‘ave know this quilt from when I first started it… it is a king size quilt. So it will go, I don’t… never have anything that can’t go on the bed or in the wash. So this may go on our bed, it may not. I may find a recipient for it. It’s pretty… esoteric I would say so there’s not, certainly not the younger member of my family or friends would probably not want it… because it is very much you know we’ll have it now. However I have got friends, Kathy, who you know who if I were to give it to her would be totally delighted with it. So I don’t know… what I am going to do with it. But it’s been a lovely journey and I feel me and my quilt we’ve got quite a relationship. And this is the sort of patchwork and quilting I love, because it’s not about the end product, it’s about the journey… and this is still about my journey. JW: Have you got any idea how many pieces there are in there? JI: Yes I tried to work it out knowing that you were coming and there’s …the two shapes of the lozenge and the one inch square and I think there is just under 7,000 pieces. JW: It’s huge [talking together]. JI: Well, well it is 102 long and 92 wide…. We have got a king-size bed if we are going to have it and it will make a nice throw if somebody wants it to go on a sofa. I think it would probably go quite nicely on a sofa. And this summer I must take it up to show Diana because it was four summers ago that I think she saw it just about going together and I really would like to take it back saying I did it [both chuckle/laugh]. JI: As I say that is the picture of her quilt [talking together, JW: Yes]. No that’s a picture of one that was made by another quilt group and if you would like that postcard of the original Lucy Boston Quilt. JI: That’s the one that’s on the bed in Hemmingford Grey. JW: Thank you, ok going so back a bit can you tell me when did you first start quilting? JI: I did a little bit, sorry, I did a little bit when I was at college training to be an OT. Because we dabbled in lots of things but nothing significant. [background talking] OT means Occupational Therapist, sorry about that, get into jargon here, but the time I would say I actually started was my first son was born in March 1983 and we moved into this house in July 1983. [Microphone noise] In September 1983 I joined a newly formed quilt group in Epping, which, I felt I needed some social contact ‘cause I was a, a stay at home parent at that stage. I wanted something to do and some social contact. I joined this group and the first formal piece of quilting I did they said they were gonna do a group quilt and it was to be in pink and green and the blocks were gonna be ‘Bears Paw.’ So I can honestly say that was my first bit I did. And that was machine pieced which freaked me out because one the girls in the group had spent most of her time with her husband in America. Although she was British and she said this is how you piece a quilt, so that was quite a baptism of fire. That group I stayed with probably ‘til, probably about 15 years. I think it’s till I went back to work full time then everything fell away [chuckles]. Yes that was my first thing and I started doing quilts, we used to go away for weekends. We used to meet every fortnight rotating through people’s homes. I made a lot of cot quilts for, for friends’ babies. Having a young child yourself you link in with other mothers. They’re all having babies, so I don’t think there is many of my friends’ kids that haven’t got my quilts. Quite nicely they say, ‘I remember that quilt you made for me’. So and it was at a time when there was not the range of fabric or fancy schmanzy things for babies that there are now. I have a quilt that the group made for me for my second child which they have all signed on the back. Although he is over 30 now he still says, ‘what about that quilt your group made for me.’ Mind you I have not let him have it ‘cause I don’t want him to [chuckle] lose it. So that, that was when I first started. JW: The first group quilt that you were involved with, d’you know who that was given too? JI I do, it was one of the group members’ sons was getting married and we do… we gave it as a wedding present. All the group quilts after that were raffled or donated to charitable causes. Whoever was leading on that quilt was able to nominate the charity. I don’t know whether you remember the bad storm of 1987 we made two quilts and bought six trees with the proceeds of that. Six trees that had got blown down in Epping Forest, so we bought the trees to replace the ones that got destroyed in the storm. JI: Proceeds of the quilt. JW: Wow…. Have you any idea over the years how many quilts you have made? JI: [Breathes deeply] Must be more than a hundred. My problem is that I should have kept a record of all of them. Because someone will say, ‘Do you remember that quilt you did for me?’ and I would say, ‘no’… ‘yer know the one that I asked you to match this and this.’ So I have been naughty in so far as I haven’t kept a record. In hindsight being the exact science it is, I wish I had. JW: Yeah. So you talked about, really you prefer hand piecing [talking together]. JW: And hand quilting, Why is that? JI: ‘Cause it is something you can do in a relaxed atmosphere. You don’t have to get loads of gear out. It can be sat beside your chair. It can be in your handbag. As I say you can take it all over the world with you. I mean I have sat waiting for outpatient appointments and things, yer know, kids off playing football, I have sat in the car and done these pieces. It is something you can do for five minutes or five hours. It is the connection between your hand and the fabric and the product, which to me, and people will laugh probably, it is about a spirituality. About the quilting being a meditative process. I am a knitter as well and I see hand piecing and hand quilting very much the same as I see my knitting in so far as it allows your thoughts to percolate. It is something that is not anti-social when you are doing it. I can be sitting in the car, I’ve done it on the tube, done it on trains, planes. Actually people engage in conversation with you as they will ask you what you are doing. And then when you tell them, ooh, yer know so it is a good conversation piece. Bit like having a dog. Yer know people come up and talk to you. People say, ‘I do that’ or ‘my friend does that’ or so, from that point of view I feel it is something that engages you with people… at a deeper level. I am not knocking quilts that are rotary cut and whizzed up and done in a day and they look fantastic and I have done lots myself. But if I were to say what my preference is, it would be this. My husband when I left work to have my first child bought me a very nice beech rocking chair. I had this vision of me sitting quilting with my children playing nicely at my feet. I don’t think I sat in that rocking chair once when they were babies or young children. However, it was very good for hanging their coats and their football boots and everything on it. I have still got my rocking chair and I still have this vision of me perhaps being an old lady, sittin’ in my rocking chair, doing it. You can sit and do hand piecing anywhere. In fact I have stood and done at times. JW: Is there any particular part of the process that you enjoy most or dislike most? JI: I like it all. I like the repetition of it. The fact you can get into a flow with it. The point is you don’t have to dislike it because if you don’t want to do anymore you can just put it down. Yer know perhaps I have had a couple of nights when I did not want to think too much about what I was doing so I would cut out my pattern pieces. Or I would cut out my papers. Or I would, baste the pattern paper on to the thing. But with this I had lots of processes going at any one time. So if I didn’t fancy the colours I was doing then I would just pick up another lot and do them. So, yes, it’s quite a boring task this, a repetitious task, however, because it’s so large and because the bits are so different, you can actually pace it. As I say, as I say I started it in 2001 and it is now 2014, so I have been working on it for 13 years, so I have not worked on it solidly, it has been something that has come and gone. It has always been there. If we go away on holiday now, and I think, oh I must take something, this is now too big to carry and that is why I have started another one. That is why I have started another one and I did not know where this is going when I started it in terms of… I had seen what Lucy Boston had done with hers, but did not know whether I was going to take the same journey as her. As a matter of fact I have taken a very similar journey. When you see her quilt it is just so different to mine in terms of, she uses a lot of striped fabric, which I don’t think, don’t think there is only small amounts of stripes in there. As I say I just used what I got. JW: Did you manage to use what you have got [talking together] [JI: Other than…] other than backing and sashing? JI: Yes I did. Because I didn’t. All the time I was doing this I was involved in other projects. So if I was involved in another quilt, a lot of these will have… be the off-cuts from quilts I have made or projects I have been involved in. Dresses I have made, clothing I have made, so over the years I have incorporated… I mean, this bit here I had a really lovely shift dress out of that that I wore for years and years. I didn’t realise how nice it looked with the mauve and thing… that was a shirt I made. This was a quilt that I made, all these pinks was a quilt that I made for a friend in America. What else is on here? This is your traditional Laura Ashley that my Mum gave me 20 years ago and has been sitting in the thing. Another Laura Ashley down here. What else can I tell you on here? Oh yeah this was, this was, Laura Ashley fabric, some of the first I ever bought. Made a quilt out of the pinks and greys. People were horrified when I was using so many tones of grey, but actually it pulled out that putting the pink with it just made such a difference. And all these squares I used to belong to a fabric club where they sent you every month a great stack of stuff and what do you do with it? So the inch squares in this, I just stripped up stuff and put it in there. The reason they are all so different it is because they came from that fabric. This was a quilt that I made for my brother who was in Kuwait, all Laura Ashley. All these are projects. That was a project, this was another one. This quilt I made an orange one. This was a quilt I made for my younger brother. Quite a lot of mauve in here, that’s my favourite colour. So there is a quite a bit of mauve. Sorry. JW: So apart from this amazing huge project you talked about making other quilts –how do you get your inspiration or what triggers off making another quilt? JI: A wedding or somebody moving house and… inspiration, look at all the books. I asked people want they want. I haven’t in the last ten years made anything that hasn’t been for somebody and it started off for somebody. The thing is that you can go and learn and do various things and you can make using this technique or that technique but I always has a difficulty with making something if I don’t know whose, whose gonna be using it. I have got a totally whole piece quilt we use on our bed during the summer the whole time. That quilt over there is Peter’s quilt, that was just made, Peter is my husband and he wanted a black quilt and it was using where you have the three squares of fabric and you cut it up and re-join them all. On our guest bed we’ve got a double wedding ring quilt which was made for the son of a friend of mine but he, I’d started to make it and then saw… he did not know I was making it for him and then saw what their décor and colouring and it was completely, wouldn’t have fitted in and I wouldn’t have given it to him. Because I like to give things as surprises, but you can be really caught out by surprises. Caroline Kaye, I made her a wedding quilt. Knowing her really well, I used a fawnie creamy colour with pastel pink/blue/yellow & green small floral pattern overall. It just fitted in and I knew her well enough to know what she would like. I haven’t made, the last actual quilt I made for somebody was for my grandson but there again the young folk of today have very different ideas about what they would like and I have to say I haven’t seen it on his cot. He is growing up and he may want, he may ask me for one and I would be happy to make it. All my family members, most of my friends have all got a quilt of mine, either on the bed or whatever, I can’t tell you how many I have made. I have made Christmas quilts, even before they were popular, lot of christening quilts. I made a fortieth wedding anniversary quilt which was double wedding ring done in reds, yer know for the ruby, which was really nice. I’d like that myself. I do like to make things that I do like for myself. Which is a bit of a disadvantage if you are making for somebody else and they choose something different. If somebody wants me to make them a quilt I come and say come and look through some of the books and come and tell me what colours you want. Then we put things together. Fortunately I haven’t been asked to make one for a very long time which has enabled me to concentrate on my own work and not worry that I have to get it done by whenever. As I get older I do not want to have the deadlines. So this one as I say, may not be finished till there… I said to Peter if I die before it’s finished you’ll have to wrap me up and put me in it and bury me in it [laughs]. JW: You mentioned you were with the Epping Quilter’s group for 15 years and then, what happened after that? Did you move to another group or…? 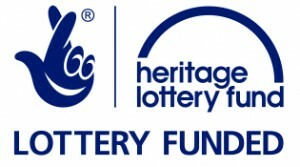 JI: At the same time that I was with the Epping group I was with a Walthamstow group called the Marsh Quilters. I think groups form, for me, have a function at different times in your life. I keep trying to go back to the Rolly Rally Quilters but the reason I don’t go is because they do not fulfil the function that I need. When I belonged to both Epping and Marsh, when the kids were little, they were sort of like my point of sanity. I had really good friendships with a lot of lovely women and we went away for weekends and quilted and did things together. I suppose when you lose the need for a group like that it’s not much fun in going. Perhaps I’ll go again now I am retired. JW: Over the years you have done quite a lot of workshops and so forth. JI: Not a huge number. I have a good basic, L mean I did A-level dress and level 3 City and Guilds and have very good basic sewing skills. There isn’t any, there isn’t and this sounds quite arrogant but there isn’t anything I can’t work out for myself. Given the book or whatever. However, I do recognise that sometimes you actually need to take yourself away and do something. With the Epping Forest Quilters we used to twice a year we used to go away for a weekend and we would make a particular, everybody would do the same thing and we would make a Amish Quilt and we would make… Double Irish chain, or whatever. What is amazing is how things have changed over the 32 years I have been quilting, in so far as it’s a long more zany now than it ever was. It was much more traditional and muted. It has just taken off. The quilting you see now is the standard and the quality of some of it you see at the shows is, is beyond, belief about what was being done 30 years ago. I mean we were just delighted if we got something finished, you know. ‘Cause you couldn’t get the fabric, it all had to be sent for. There you go it has moved on. I think youngsters of today would take a very different path with this, this sort of craft. JW: So where do you access your fabric nowadays? JI: Anywhere and everywhere really. Certainly can’t walk past a quilt shop or fabric shop of any sort without buying stuff. I got enough here if I live to be 200 to, to work with. Online, at shows… I made myself a promise last year, 2013, and I have carried it through to 2014 that I have not bought any fabric, because what I am doing is using what I have got. I have decided that for the foreseeable future that is what I may do. Unless a project comes, comes to mind that I need to go out and buy fabric. I have got fabric I have bought in India, I have got fabric I have bought in Singapore, I have got fabric I have bought in New Zealand, in the States. And as I say I have got heaps of stuff. The thing is I have not stopped buying books which I have now tried to do, ‘cause in actual fact there is books on this shelf here that I had forgotten I had got. And I just think that it is all very well to go and buy another book ‘cause you love it and yes there is no reason why you shouldn’t, but I think if I went back and looked through all my books I would have enough inspiration there. I buy the odd quilting magazine but not very often. My son bought me for Mother’s Day two or three years ago the subscription to Fabrications. He renewed it and I said don’t renew it anymore because I have got so much stuff. Sometimes if you are browsing in the newsagent and something leaps out at you, then I buy it. But I think it is easy to and the process of being a quilter, and being part of this fantastic art form is that you always want to buy and you always can buy. There is nobody I know who is a knitter or a sower who has not got heaps of stuff and there’s real value. Sometimes I just look through my fabric and I think that is a really lovely thing to do. Perhaps sort it out or put the stuff together or have seen something and thought, ooh I’ve got a piece of fabric like that. That is good, even sorting your threads. One of the tasks I am going to do is catalogue my books; all my quilting books. And in doing so I shall start looking at them again and reminiscing, because a lot of stuff I have made stuff out of. JW: You mentioned you are an Occupational Therapist, and having done some creative activities whilst you were training, have you been able to incorporate your quilting into your work in any way? JI: Certainly when I started and I was a traditional Occupational Therapist and I kept people occupied, yes I’d used that in, I have certainly used hand piecing, because it is very good. It is very structured and it’s non-threatening and you can do it in small pieces and not threaten people with something as huge as this you see here. You can get results very quickly with it. It is low cost in equipment and things like that. But recently my last few years working has been working with people with dementia, certainly, people with fairly severe dementia, and I have been able to make some sensory quilts i.e. out of fabrics that is different colours and different textures, and incorporate all sorts of bits and pieces into the quilt so that people with very limited skills can still have something to enjoy. And it stays on their lap easily and is comforting. However, using this sort of thing in an institutional type environment, i.e. hospital or care homes, often means that the quilts go missing. I have, certainly when I worked for a local Trust, made probably 10 or 15 quilts for people. And cushions as well, ‘cause the cushions are quite nice to put some different textures, sparkly bits and frilly bits and bits with bobbles on and tassels and fringe. That for me was really great because let rip. Not matter what you put on it was going to be good, as I was going around I saw trimmings or buttons or anything or whacky, zany fabric I would buy. In fact in my loft I have got about six Chinese laundry bags full of the stuff that I am looking for someone to donate that too [laughs]. Because I don’t think I shall be, well I may do, never say, never. There is a big bit of me that thinks that actually ‘cause I have retired now, that things will end in terms of, that sort of thing, but I don’t think they will. The requests and the opportunities won’t be as great but I’d like to be able to take advantage of them if they did come up. There is a lady actually in this road who is rapidly progressing with dementia and I may like to do something for her. So, yeah. JW: You have mentioned about your family. Does anybody else in your family quilt? JI: No, my mother sews is more of an artist and embroiderer but she doesn’t quilt. No, no, we are a very small family and predominantly male. Not, not that that is a reason [both chuckle] but we are very small and hopefully if I get some granddaughters I may be able to pass on my skills but certainly my two daughter-in-law’s are too busy working hard and bringing up families and do not have the same interest as I do. However, one of daughters in law grandmother does so we chat about it, so that’s good. JW: I have asked all my questions. Is there anything else that you feel that you have thought that we might cover that we haven’t? Anything else you want to add, that is important to finish your story? JI: I don’t think so specifically because I have actually sort of, before knowing that you were coming round, I actually, sort of, jotted down some ideas of the things I thought were important and things that I would hopefully be able to get over in the interview and the unstructured nature of the interview and the focus of this quilt has actually enabled me to, to put over what I feel is important. It would be interesting to read the transcript [JI laughs] and possibly I might have questions tomorrow or next week but for the moment I think that the points that I’d actually thought about I have got through. It is about being a purist really and being traditional, and it being a labour of love rather than something you have to get done. I don’t know how well I would do back in the eighteenth century when you had to do this to keep yourself warm [JI chuckles] I think I might have been a bit chilly if I had taken this approach. I like the whole idea of this being a predominantly, but not exclusively, a female art form and about it being useful as well as decorative. Although I have made quite a few decorative wall hangings I never feel the same about those as I do about something you can cuddle up in. It is about the warmth and the love that should be in a quilt that is probably something I haven’t said, it should, it should demonstrate the love that has gone into it. As I have loved doing it. If I was making it for somebody in particular I would be thinking about them as I was doing it and they would like this colour or I won’t put that in ‘cause I know they don’t like red or their bedroom is mauve, so let me put some of those mauves in there. Or I know what sort of personality they are and try and give them something, something that they want and would love.